In its early years, the stock exchange in The Hague was organized in a room above a clothing store. Soon, this room proved to be too small, and on top of that, it was not representative enough. Therefore, a new exchange building was opened in a former church on the Nobelstraat in 1912. Securities companies in the province were not allowed to be a member of the Amsterdam exchange, and therefore, they paid the maximum rate. To strengthen their position towards Amsterdam, they decided to join forces in the Provinciale Bond (Provincial Federation) in 1903. 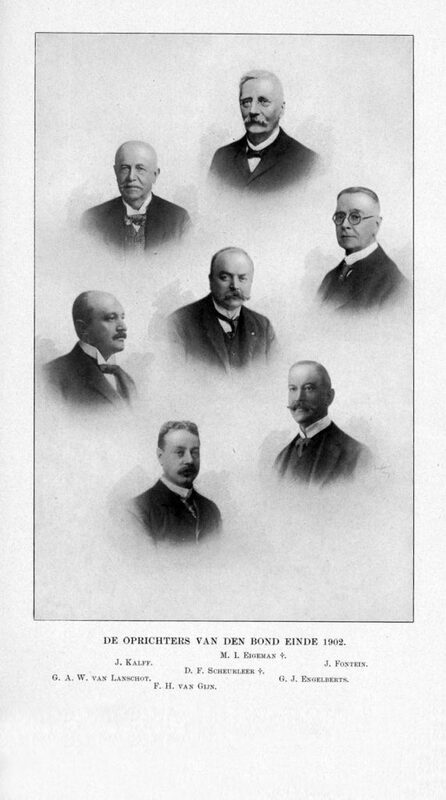 The picture shows the founders, some of whose names are still well-known. Rate booklet for securities brokerage for customers of the local associations of the Provinciale Bond (Provincial Federation). As securities companies in the province had to pay more for transactions on the Amsterdam exchange, they struggled to compete with their colleagues in Amsterdam. The Bond grew steadily. In 1913, as many as eighteen securities associations, which jointly represented approximately eight hundred securities companies in the province (in other words: the Netherlands minus Amsterdam and Rotterdam), had become members. The picture shows one of these securities companies: the S.E. Sangers Firm from Groningen. As a result of their dissatisfaction with the Amsterdam stock exchange, securities traders in The Hague started their own exchange in 1905. A point of dispute was the commission scheme. Amsterdam exchange members could profit from a better rate on the Amsterdam stock exchange than parties from outside the capital. The Bond voor den Geld- en Effectenhandel in de Provincie (Federation for Money and Securities Trading in the Province) was founded in 1903 to act as an interlocutor for the board of the Amsterdam exchange. The latter only wanted to talk with the federation if it had at least 400 members. 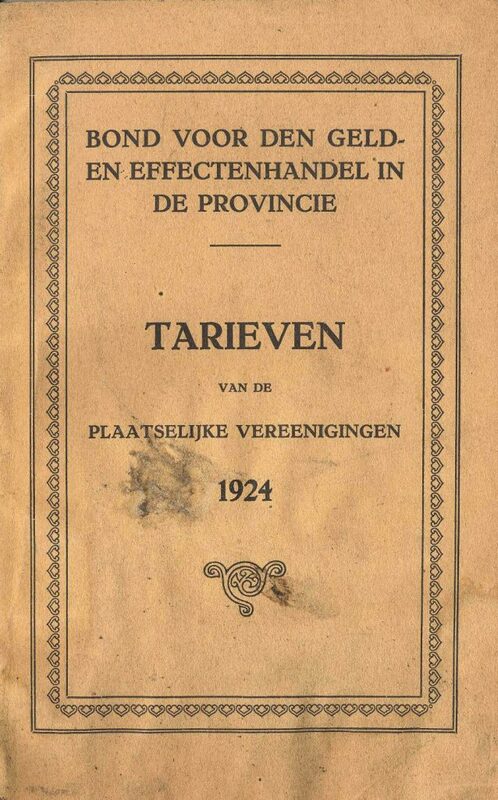 In 1905 – when the number of members had risen to 650 – the Vereniging voor de Effectenhandel and the federation entered into a commission agreement. A growing contact between the Amsterdam and Rotterdam associations and the federation led to a fledgling national consultation structure. The federation represented securities traders from across the country with the exception of Amsterdam and Rotterdam. In 1913, eighteen provincial associations for securities trading had joined. The Vereniging voor den Haagschen Geld- en Effectenhandel (Association for Money and Securities Trading in the Hague) was the most important player within the federation. 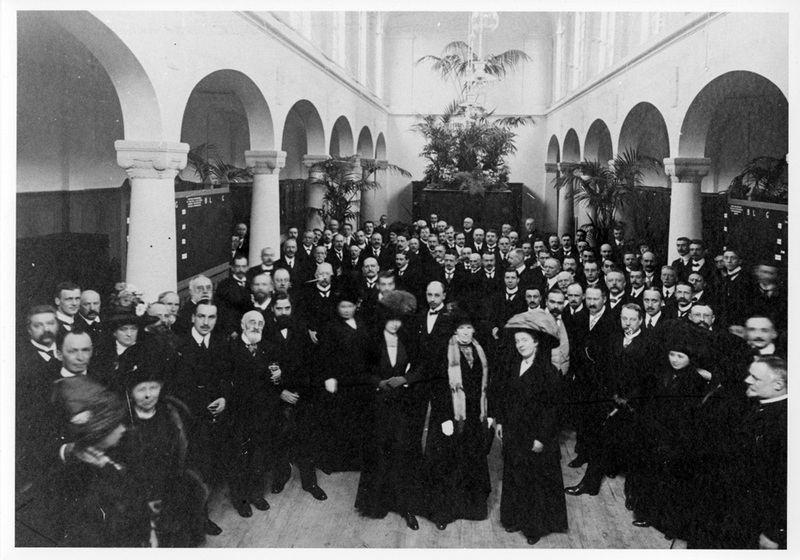 In 1905, the association took the initiative to establish a stock exchange in The Hague. For this purpose, it rented a room above a clothing store on the Wagenstraat, where an exchange was organized from noon to one P.M. Members of the federation from outside The Hague could conduct trade here as well. After much discussion on the funds that should be listed and the question whether the stock exchange should have its own pricing, the board decided that shares that were listed in Amsterdam would also be traded for the average prices established there. Loans from official bodies and specific funds from The Hague could be listed as well, but these were barely traded. In practice, it was primarily mutual trade in main funds from Amsterdam that was conducted, such as Koninklijke Olie, Philips and Unilever. 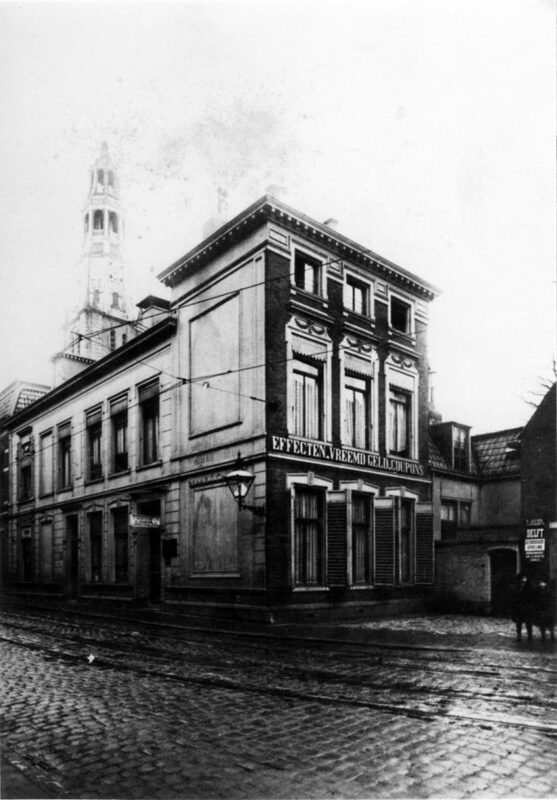 In 1912, the stock exchange bought a Reformed church in the Nobelstraat, where securities trading was conducted from that moment on. Out of the three securities exchanges in the Netherlands, the one in The Hague was by far the smallest. As of 1972, it merged into the Amsterdam stock exchange along with the securities exchange in Rotterdam. Its official abolition followed in 1974.